Heat oven to 425°F. In 1-gallon resealable food-storage plastic bag, place cereal; crush with rolling pin. Add Bisquick® mix, paprika, seasoned salt and red pepper; mix well. In small bowl, stir together oil and pepper sauce. Coat chicken pieces with oil mixture. Shake about 6 chicken pieces at a time in bag of cereal mixture until coated. Shake off any extra mixture. On ungreased cookie sheet, place chicken pieces in single layer. Bake about 10 minutes or until chicken is no longer pink in center. Meanwhile, in small bowl, stir together sour cream and dressing. Serve sauce with chicken. Add some wholesome veggies to accompany your lunch. 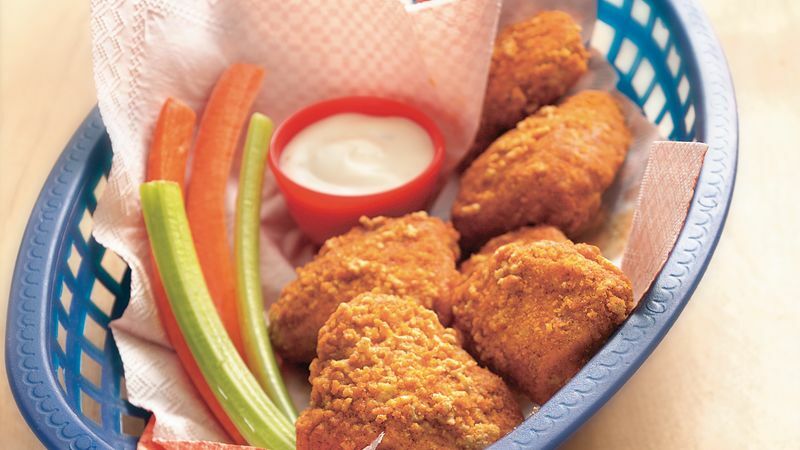 Try a side of crunchy dippers such as celery and carrot sticks, green bell pepper strips and cucumber chips to serve with these spicy nuggets and zippy sauce. Dip in your favorite reduced-fat or fat-free dressing.